"Fans need to know facts"
Education: Public elementary school. Entered private Lakeside School at age 12. Dropped out of Harvard Univ ersity junior year. Little known fact: His family called him "Trey," in reference to the III after his name. Hobbies: Bridge, golf, reading, philanthropy. Claim to fame: Leader of the computing software's industry. 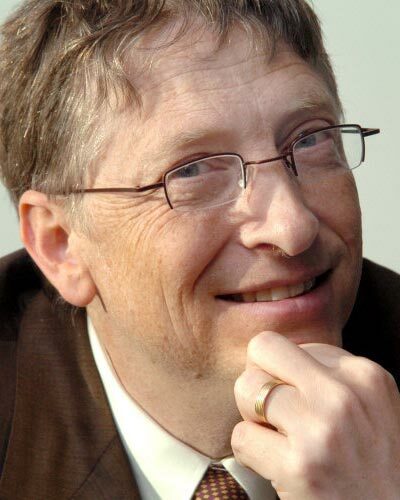 Net worth: Bill's all-time high net worth is $88.82 Billion. Visit Net Worth Page for current net worth. Annoying traits: Compulsive rocking, glasses that won't stay perched on bridge of his nose. Family: wife, Melinda; daughter, Jennifer, born 1996; son, Rory, born 1999.
earns appx 243 Dollars a second.